Loaches are a striped bottom-dwelling fish that are usually a good choice for a beginner aquarium hobbyist. These freshwater fish can tolerate smaller tanks, some tank water fluctuations, and are a peaceful species. There have been no cases of breeding of this species in a home aquarium. 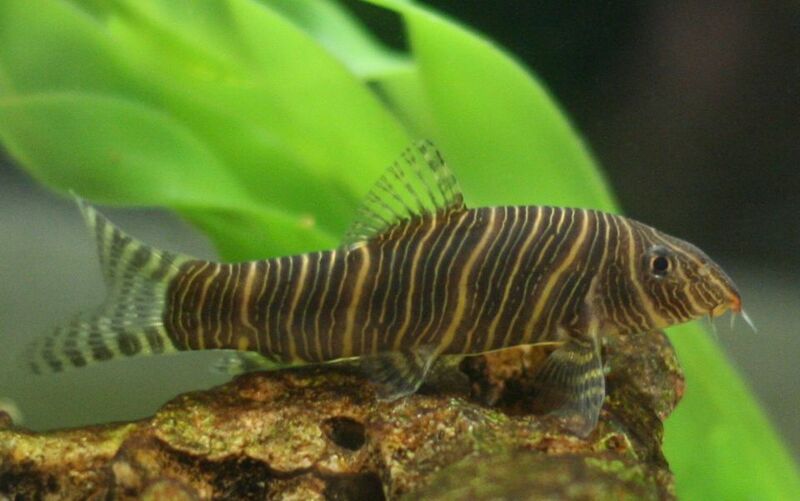 The coloration of the Zebra Loach is the basis for its scientific name, Botia striata, which is derived from the Latin word striatus, meaning striped or striated. There have been other scientific names given to this loach, most notably Botia hymenophysa, which is a similar species. However, each species originates from different locations. B hymenophysa is found in Malaysia, Thailand, and the Greater Sundra Island, while Botia striata hails from the Tunga River system in Karnataka, located in the southern part of India. Zebra loaches have also been found in several areas within the Krishna drainage. Although the waters are clear in some regions, other locations this fish inhabits are muddy and oxygen-poor. It is not unusual to find zebras in the company of other Botia species. Zebra loaches were first introduced to the aquarium trade in 1952, and have continued to remain popular among aquarium hobbyists. Specimens sold in the trade now are either wild caught or captive bred. Breeding this species in captivity have been unsuccessful for the home hobbyist, and commercial breeding has only been successful through the use of hormones. One of the smaller members of the Botia family, the Zebra loach reaches a maximum adult size of about 4 inches, although they often are a bit smaller than that. Zebras are boldly marked with vertical stripes, giving them one of their most widely known common names. The base body color is yellow to yellow-orange in color, fading to a cream color on the belly. Zebras are striped over the entire body, including the head and fins, with the only exception being the belly, which is cream colored and free of any stripes or patterns. The stripes on the head slant backward, while the stripes in the mid-portion slant forward. Those near the tail are almost vertical. These stripes vary in width, from narrow to thick, sometimes breaking up in such a way as to give the appearance of a maze. The color of the stripes also varies, from pale yellow to deep brown to gray, and may even take on a blue or greenish hue. These variable colors give rise to another common name, candy stripe loach. The head of this loach is blunt with three pairs of barbells that grace the nose, one maxillary set, and two rostral pairs. Young specimens have a red nose that fades as they grow older. Zebra loaches are peaceful and prefer to live in small shoals that will typically cruise the tank together. They are more active at night than during the day but are still more active during the day than most members of the loach family. Generally speaking, they are not aggressive and can be kept with many other species. However, their boisterous nature can stress fish that are timid or shy. Zebra loaches are avid consumers of snails, making them a great means of keeping snail populations under control. It has been reported that when stressed, they are more susceptible to ich. Observe them closely for signs of ich whenever moving them or making other potentially stressful changes to the habitat. Zebras are an excellent choice for the community tank, due to their generally peaceful nature. They must be kept in groups of at least four or more. Avoid keeping them with other small bottom-dwelling fish, such as members of the cory family, as they compete for space and can exhibit aggression in these situations. However, they will tolerate other Botia species quite well, and will even school with them. Other potential tankmates may include tinfoil barbs. They also enjoy the company of the popular clown loach. Also to be avoided are fish with long fins, such as angelfish and bettas. Even long-finned guppies or small tetras may fall prey to being picked on. Although more active during daylight hours than other loaches, the zebra loach still requires a habitat with plenty of hiding places, to feel fully secure. Driftwood, piles of smooth rocks, flower pots with openings, or simply large tubes, all will suffice as shelters. Plenty of plants will round out the habitat, either real or artificial. Take care to ensure that all decor is free of sharp edges, and make sure all openings are large enough to ensure the loaches will not become trapped. Zebras love to rummage for food morsels, and even burrow into the substrate. Their barbells are quite sensitive and subject to irritation if the substrate is too rough. Therefore substrate should be soft; either smooth edged fine gravel or sand. The tank should have a well-fitting cover, as this fish will escape if it finds a large enough opening. Filtration should be sufficient to maintain high water quality, and weekly water changes are important. Zebras cannot tolerate elevated organic or water chemistry fluctuations. They should not be introduced to a newly set up aquarium or a mature aquarium that has an excessive build-up of organic waste. Water temperatures should be 73 to 79 F with soft and slightly acidic pH (6.0-6.5). Lighting should be somewhat subdued. Zebra loaches are omnivores and readily accept a wide range of foods. They are particularly fond of live foods, such as bloodworms, glass worms, tubifex, daphnia, and brine shrimp. In addition, to live foods, they also will eat fresh vegetables and even fresh fruits. Flake, freeze-dried, and frozen foods are also avidly accepted and add to a balanced diet. Sinking foods are helpful in a community aquarium, to ensure the Zebras get their fair share at feeding time. There are no obvious external differences that can be seen between the sexes, although mature females may be a bit more rounded in the abdomen than males. There have been no reports of successful cases of zebra loach breeding in home aquariums. Commercial breeders have been successful only through the use of hormones, a practice that is controversial. There are also reports of crosses with similar species. Check out additional fish breed profiles for more information on other freshwater fish. Why the Long Horseface Loach Fish Face?